» An Albany police-Linn sheriff merger? An Albany police-Linn sheriff merger? 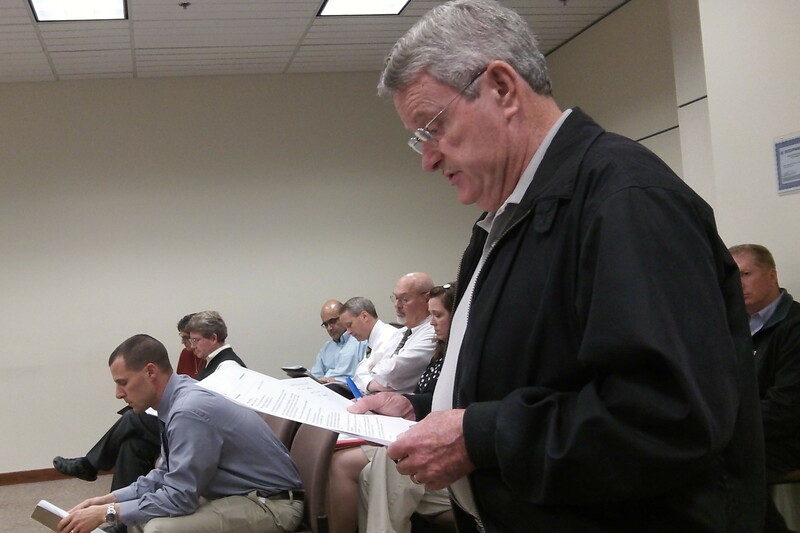 Tom Cordier reads his proposal to the Albany City Council Monday. Merging the Albany Police Department with the Linn County Sheriff’s Office is about the furthest thing from anyone’s mind these days, with the exception of Tom Cordier. In emails, a talk with the county commissioners and a Monday appearance before the city council, the retired North Albany resident has been suggesting that Albany conduct a detailed study of such a combination in the interest of saving money. The county board is reluctant to initiate such a study on its own. And the council Monday greeted Cordier’s brief address with a thank-you from the mayor and no other comment. Cordier thinks the city should examine whether it could save money, especally now that is is proposing to build a $15 million police headquarters if voters approve a bond issue in the May 19 election. It’s unclear how the construction project bears on the merger notion since a combined police force would still need a headquarters, a place far bigger than either the police station or the sheriff’s quarters at the jail on Jackson Street. Cordier pointed the council to a wealth of literature available online concerning police-sheriff mergers across the country. He also mentioned the Oregon cities of Wilsonville and Troutdale. Wilsonville gets law enforcement from Clackamas County, which supplies the town with a police chief, one school officer, one detective and 15 deputies, asccording to the town’s website. In Troutdale, the city council last month approved an agreement to have the Multnomah County sheriff take over the city’s 27-employee police department. According to a story in the Gresham Outlook, the sheriff will make the police chief a commander in his department, hire 9 Troutdale officers directly and put 15 others under contract with the sheriff, all of them for more money than they make now. Despite the raises, the city’s policing expense is expected to drop from $3.9 million to $3.1 million a year, even less in following years, but the paper didn’t explain how that’s possible. The Albany Police Department says it has 60 sworn officers and 28 support workers. The Linn sheriff has 193 employees in six divisions, according to the department website, though that total likely dates from before several more were just hired to run a newly opened wing of the county jail. The sheriff’s office also provides law enforcement under contract in Brownsvlle, Harrisburg, Mill City and Scio. It also has substations in Lebanon and Sweet Home, which have police forces of their own. From a taxpayer perspective, analyzing the feasibility of increased coordination and consolidation as a means to deliver more efficient and effective law enforcement services makes a lot of sense. We’ll never know the feasibility, however, unless a professional, independent study is conducted. And there is the rub. Conducting a joint feasibility study would require the city to play nice with the county. It would require a mindset open to new, and possibly better, forms of providing service. This is no doubt a disruptive notion to the closed minds and turf protectors at city hall. Therefore, the probability of Albany participating in this type of study is virtually zero. published studies I cited–one done by U of O concerning all of Lincoln County Oregon. property tax compression problem that exists and seems to get worse by the year”. Here is a link to a short overview conducted by San Francisco that shows some rather large cities-counties that consolidated their police & sheriff. The document provides a rationale for the city council. And here is an example of a feasibility that was done in Lincoln County Oregon focusing on consolidating law enforcement services. The study provided multiple options, cost savings estimates, and recommendations. The study was conducted by the University of Oregon. This is the type of independent, professional study that Albany may want to consider. Saving money sounds good, but I’m sure they can find a way to spend any savings. OTOH, I prefer the idea of independent agencies. Kind of a “one keeping the other honest” theory. George Miller was sheriff from 1953 to 1973, and his Chief Criminal Detective was Kenneth Goins. Kenneth Goins was sheriff from 1973 to 1987 and the Undersheriff was Art Martinak. Art Martinak was appointed sheriff to complete the term in 1987 and served until 1995 and the Undersheriff was Dave Burright. Dave Burright was appointed sheriff to complete the term in 1995 and served until 2005 and Tim Mueller was Undersheriff. Tim Mueller was appointed Sheriff to complete the term in 2005 and served to 2014, and Bruce Riley was Undersheriff. Bruce Riley was appointed Sheriff in to complete the term in 2014 and serves to today. The question here is not about the men themselves. It’s about the process of an elected sheriff vacating an office early, so that his appointed subordinate becomes sheriff, so that successor has the name recognition that comes from being the sheriff. That clearly provides a leg up on any challengers that might seek election. It is a perfectly legal way to try and steer an election towards a person you support. It is clearly the way Linn County has done business for decades. The only problem is that it’s not ethical. It does not present a level playing field for all potential qualified candidates to compete. So when citizens are being urged by an elderly gadfly named Cordier to combine all law enforcement powers under a single individual, one not subject to oversight by the county commissioners or a professional manager, folks ought to take a long deep breath. Is it really about saving money, or is it about just one in a string of cynical attempts to sink a bond issue? “Elderly gadfly”? Since when do people taking part in a free exchange of opinions about public affairs resort to denouncing their opponents based on their supposed age? Have we sunk that far now? As for the way the sheriffs’ succession has been handled in Linn County, there’s nothing unethical about it. On the contrary, it helps electors. If they have re-elected sheriffs because they are pleased with their conduct and their service, they can then rely on the incumbents’ judgment and recommendations when it comes to a successor. Voters don’t have to take the previous sheriff’s recommendation, but in Linn County they’ve been wise to do so repeatedly for more than a generation. I’ve known all the Linn sheriffs since Ken Goins and found them all to be competent men of integrity. As I said, it’s not about the men involved. I have no beef the way the department has been run. The ones I have seen have done fine. It’s about manipulating the electoral system. In this case my guess is that they all would have won the election anyway. Fair play is what Americans are supposed to be about. We don’t like it when we see foreign governments stack the deck for the deck for the “inside man” and we shouldn’t do it here either. As far as ageism, I think most of the bloggers here are replete with lot’s of gray hair. I know that fits me, and being in my mid-60’s I now have my share of senior discount cards. I consider myself old – it’s a fact of life. I am an elder. Bob, you want us to see your “elderly gadfly” comment as self deprecating? Bob, you weren’t talking about yourself. Bob, you may well be an elderly gadfly. Speak for yourself. You remind me of the kid that just romped through my just finished concrete and is trying to deny you did it. You probably have no qualms about the Oregon Secretaries of State manipulating Voter Pamphlets & petition signatures since Barbara Roberts. I support clean government. The political party involved is immaterial. And yet you supported Kitzhaber, knowing things were “fishy”. I supported Kitzhaber knowing that his girlfriend had lied to him, because Dennis Richardson was someone who I could never support given his stance on the issues, and because Kitz was more aligned with my ideals. After the election, when more and more came out, and it became clear that Kitz supported his girlfriend regardless of the damage that support was doing to the state I called for his resignation publically. If republicans quit nominating the extremists of their party they might actually have a chance of winning. Dudley was a vastly more acceptable candidate, but he had no track record and some baggage of his own (like not living in Oregon). All anyone needs to do is look at the election results. The republican party as it stands is a disaster. No governor in ages, and unable to hold either the house or senate. It’s like baseball. If you keep losing, you need a new manager and a better team. If you folks will moderate and move to the center, you’d have a better chance. But you won’t. So the rest of Oregon is content to wait you out until your kids find a better way. Do any of you making/advocating this merger work in local law enforcement? I did for 29 yrs at APD & “yes” I worked with the SO at times but NO WAY IN HELL would I have worked for any of the prior sheriffs. There is so much behind the scenes stuff that the common citizen has no realization!